The focus of the 2018-2019 Compassionate Justice Series returns to an exploration of issues and concerns in Canada’s criminal justice system. 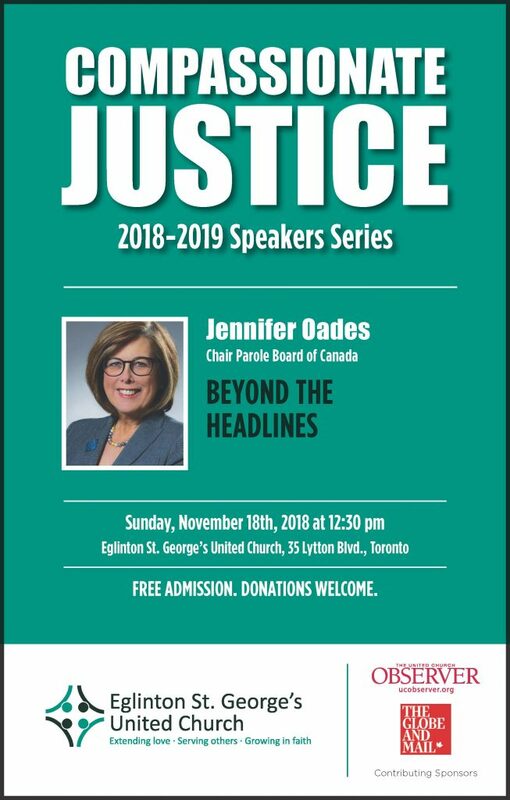 This presentation will challenge us to look beyond the media headlines, to gain a better understanding of the work of the Parole Board of Canada, and to explore better ways for the conditional release of offenders into our communities. Jennifer Oades has for over 25 years been working in corrections in Canada. She was appointed Chair of the Parole Board of Canada in January 2018. Free admission. Lunch provided at 11:45 am, with the speaker following at 12:30 pm.